Hello, Received your book today. It is great. Of course I have not read the whole book yet but what I have read is awesome. Your selection of pictures, drawings and information is impressive. I can’t wait to show your book to my family, friends and co-workers. We have been waiting patiently for it to arrive. My Grandmother, Carl’s wife, is in failing health so your timing is perfect. She is excited to show her friends. Thanks so much, I will treasure your book forever. It is a small piece of my grandfather I am very excited to have. Thank you for the book. It is wonderful. As I looked through it the night it arrived, I realized immediately that it is the quality work that my parents wanted. I remember when they would sit together and work on the book’s outline. I’m sure Mom never dreamed she would end up on the cover! What a wonderful tribute. Thank you again for the copy of the book and thank you for seeing this project through to the end with such superb results. For months and then years I feared this book would never be published. Most of the material was gathered but there were the delays and then the untimely deaths of Carol and Roger Voter. Hanging on to the research too long myself (probably a grieving process) I finally passed it on to the willing and interested Mark Fields. Sadness is now turned to unbelievable joy. Mark had stepped forward with dedication, expertise and an obvious love for the breed and has produced this splendid volume in a little more than a year. It is clear to me he is also honoring our ancestors in the Dominique world; the people whose life s work fill these pages. After reading the book I have concluded that, if ever the Dominique is going to take a leap forward in our backyards and in the show room, this treatise is what will occasion it. None of us, until now, have had the advantage of having assembled in one place so much information; so much history and know-how. Just, for instance, the two or so pages on how to cull Dominiques at four months of age, is invaluable. I once asked and got Roger Voter to travel several hundred miles just to help me cull at this age because I was ever anxious, Am I throwing out the baby with the bathwater? I predict that this book is likewise going to pull in additional information that heretofore was not forthcoming. Interested people, on reading this, are suddenly going to say, Oh, my grandfather had Dominiques and he said this and showed there and won prizes here. I suspect even more articles from the past will also cross Mark s desk. Will there be enough for a new edition in ten years? Probably. The bantam Dominique, now gaining in popularity and being more carefully bred to Standard, should surely generate new and sought-after material for the fancier. I found the book easy to read. I thought it would take some doing to cover 320 pages but charts and pictures and old advertisements moved me through faster than expected. The many photos of the breed in the book are particularly helpful, especially when accompanied by a critique of what is desirable and undesirable about the bird. Another thing I appreciate about the book is the glossy paper used and the way the book, when you open it to a given page, stays open to that page. It works just like my old and first Standard of Perfection from 1966. Unfortunately the typesetter made too many mistakes in spelling and printing. It detracts but the content is there and it is something I can live with. The overall gift of a book is too great for me to get lost in the minutiae. Carol Voter is honored on both the front and back of the bookjacket. I would suggest that noone invested more time and talent in recording and filing for the book than Carol. She is somehow fixed and immortalized by these two pictures. Again, thank you Mark. The book is entitled The American Dominique. All the old-time breeders I met believed American to be an important prefix to the breed s name. The author seems to stabilize this qualifier in including it in the title. Should we petition that it also be read into the Standard? Mark Fields has done his work and more. Now it is up to us. Will we, using this invaluable tool, breed the Dominique to perfection of old and share our enthusiasm for the breed with others? We still have a breed that is fragile on the American scene. It’s up to us to change that. By one of those freaks of luck and fortune the Dominique fowl engaged the fancies of Carol & Roger Voter, David Hyman and Mark Fields. Their devotion and labor for this monograph of their favorite breed of poultry resulted in this splendid addition to American poultry literature. One need not be a Dominique fancier to read and learn from this book, the kind of book that each henwoman and henman should enjoy. Perhaps some reader may be inspired to do the same for the Plymouth Rock, Wyandotte or Rhode Island Red. After many hours of search and research by the Voters and David Hyman; Mark Fields put it all together and composed this important breed monograph. The colored photos of Carol Voter on the dust wrapper just puts the frosting on the cake. Dominiques were first mentioned as a breed of poultry in about 1820. With the advent of the first poultry show in the U.S. at Boston, Massachusetts in 1849 with four breeders exhibiting them, the breed became the first established American breed of poultry in the country. From then on they were mentioned frequently in agriculture magazines. The APA Standard of Excellence was first issued with the Dominique in 1874. A bibliography issued in 1897 included a list found the book easy to read. I thought it would take some doing to cover 320 pages but charts and pictures and old advertisements moved me through faster than expected. The many photos of the breed in the book are particularly helpful, especially when accompanied by a critique of what is desirable and undesirable about the bird. Mark Fields has done his work and more. Now it is up to us. Will we, using this invaluable tool, breed the Dominique to perfection of old and share our enthusiasm of over two hundred poultry magazines issued in the U.S. From then on there were many articles, illustrations and advertisements about Dominiques available to those who searched. Included within this account are items relating to breeders, with their comments, illustrations and reports of production and type. Mark Fields, born in Arkansas and now residing in Missouri is a shrewd historian and engaging writer. He has organized his sources from magazines, books, photos, letters, etc. into an engaging, historical document without any flourishes or tricks. Gleanings from all these items are used in historical order by subject such as Shows, Standard, Breeding, Authors, etc. into the presentation of a complete history of the breed and what is just as important, a great overview of our relation to the hen for the past 150 years. A finely detailed table of contents is included, the only things not included are cooping and cooking. Most pleasing to me are the many written comments by and about the breeders of Dominiques, from the 1840s to the 1970s. But my favorite is the one named A Dominique Pastoral by Cornelius Weygandt. Born in 1871, died about 1950 in Philadelphia where he lived all his life. Teacher and professor of English at the University Pennsylvania until his retirement in 1945. These things he loved; his family, the English language, music, Pennsylvania and his Dominiques and Red Dorkings. Not necessarily in that order! He is just one of many fanciers quoted in this book. From Dr. Bennett & Burnham to Elva Hemphill. Many rare breeds benefit from a long, well documented, and distinguished history. The Milking Shorthorn, for example, comes to mind. Others, such as the American Cream Draft horse, are largely unknown. The Dominique chicken falls somewhere in-between. It was widely distributed through much of American history, and even after becoming rare this century was still widely recognized and remembered. But recognition alone is not enough to save a breed from extinction, and for many years, the Dominique s fate rested precariously in the hands of a very few breeders. Their efforts have been successful, and today the breed, while still quite rare, is increasing in numbers and is more often seen in poultry catalogs, at shows, and on small farms. But conservation requires more. For a breed to be conserved, its history as well as its genetic heritage must survive. Knowledge of the breed s history and character is an essential part of stewardship, since one must appreciate the breed s past in order to select stock accordingly. People who become involved with rare breeds simply because they are rare, without learning the breed s own story, are not likely to succeed. 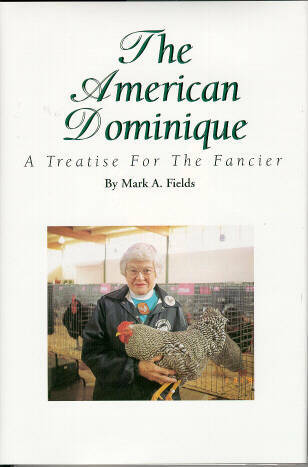 Mark Fields, the Secretary of the Dominique Club of America, has served this second part of conservation with a significant accomplishment for his breed — the writing and publication of The American Dominique: A Treatise for the Fancier. This book represents the collection and organization of over 20 years of research into the Dominique breed s history and characteristics. It includes more than 200 reference items and over 150 photographs, historic advertisements and other illustrations. Topics addressed include the breed s origins, its history, and folklore, evolution of the breed standard, genetic parameters of the breed and showing. I m a historian by training so I really enjoyed the history in the book, especially the illustrations of breed advertisements, and the old photographs, such as the picture of one of the oldest Dominiques on record, a 14 year old hen named Granny. As an owner of a small flock of Dominiques myself, I found it fun to learn more about the evolution of the breed s characteristics and its comparisons with other breeds. The American Dominique is a testament to the commitment of Mark and the current members of the Dominique Club to their breed. It is also, however, a tangible legacy from past breeders, both well known and anonymous, who have been stewards of the Dominique and its history. At ALBC, we often write about the role of each generation in conserving breeds and in passing along the genetic heritage. Books like this are reminders that people like us can make a difference. Every poultry breed should have a book like this one written about it. It is beautifully bound in green hardback with an embossed gold Dominique on the cover, and the standard of publication is excellent – photos are of very high quality, both black and white and colour. Not only is the book a delight to handle, but the contents match up to the appearance. Research for the book was begun some years ago by two Dominique breeders, Roger and Carol Voter who with a man called David Hyman started to put together the information included here. With the deaths of both Roger and Carol, Mark Fields took over completion of the work, and yet another Dominique enthusiast, Glen Mackey, stepped in and donated funds to ensure publication. So this is an example of a club working together to produce an outstanding record of their breed. Research has obviously been long and detailed, and the contents include the origin and the evolution of the Dominique chicken, detailed characteristics, genetics, characteristics to avoid, breeding Dominiques, showing them, the Dominique Bantam, folklore of the Dominique and the current status of the breed, concluding with a wonderfully funny account of ‘The Day I Et the Last Dominique. The oldest of the American breeds of poultry, this is a most attractive one and it is good to see that it is included in our latest Poultry Standards in the UK. The original barndoor fowl of the 1750s in the US, this was always a useful breed for both the table and for laying brown eggs. The determination of a few Dominique breeders not to let the bird disappear altogether when it lost its popularity for newer breeds has been well vindicated by the present growing interest. This book will attract a lot more people to the breed, and is a very enjoyable read even for non-Dominique breeders.